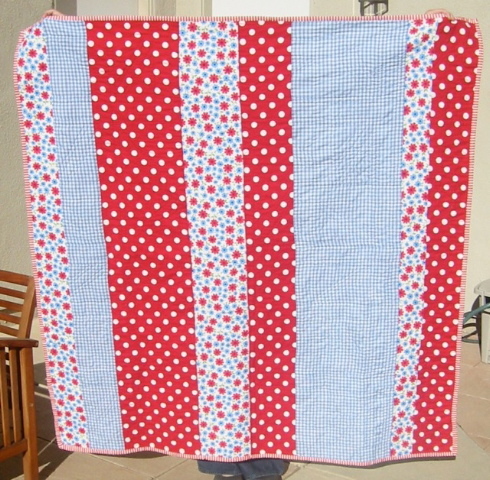 So when I first heard of J’s diagnosis, I immediatly contacted Laurie and asked her if she wanted to colaborate on a Union Jack quilt for our London-loving friend. (As opposed to me, Laurie has actually already completed a Union Jack quilt.) She was in. And she ended up doing the lion’s share of the work. 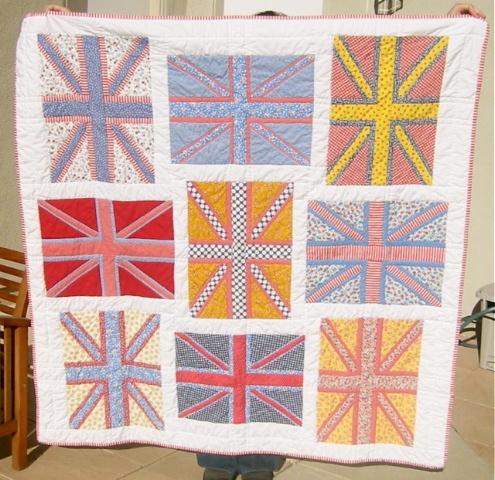 I sent a bunch of Union Jack blocks and some more fabric to Laurie in California. She procured the rest of the fabric, made the rest of the UJ blocks, assembled everything, quilted the quilt and sent it off to our friend J in Washington DC. I just happened to coicidentally talk to J today. She was finally released from the hospital after being there for weeks of chemo treatments. And she was finally at home and wrapped up in her new quilt. I was so happy that she’d received it and knew how much we loved her. J has received bunches of quilts from other loving friends, so I’m not going to pretend that this one is the be all and end all of cancer fighting quilts. But I am gratetful we did something- and that it was happily recieved. And more than that, I feel grateful for the friends God has placed in my life – especially the kind that last all these years later. Laurie – thanks for all of your hard work pulling this together so quickly. Hang in there JR. We’re pulling for you and sending lots of love and prayers (which are even better than quilts) your way. Gorgeous quilt! I love that it is full of the memories that you three forged in London. Those are the best kinds of quilts.<br /><br />Praying that your friend recovers! Who are you calling an &quot;old&quot; friend? Like I said in the accompanying card, roommates come and go but London Girls are forever. I love my quilt nerd friends. Thanks for coming up with the idea. I&#39;m just glad I was able to sew like the wind, just like the little ladies of Santa Poco. Beautiful! Hope your friend gets better. I used to work as a med tech in a hospital lab, so I know what a devastating thing this is. Luckily there are some very promising new drugs. Tough! This is beautiful! both the quilt and the love shown for a friend! Thanks so much for sharing! I&#39;m always so touched by your posts about friends in need and your love and prayers for them. Would love for you to publish a pattern for your UJ blocks and US flags, too. Those are some of my favorite of your quilts. Love the quilt and the thoughtfulness behind it all. You are always good at spreading sunshine in everyones life.<br />Hope you get your computer problems solved vrey fast. A–you guys did such a great job! It looks fabulous and I can not think of a better person for it to go to! I&#39;m sure J feels your love for her and your wishes for her returned good health every time she looks at your quilt or wraps herself up in it.